If you’re not overly picky about sound quality, the NOVA True Wireless Earbuds do have affordability and decent battery life going for them. 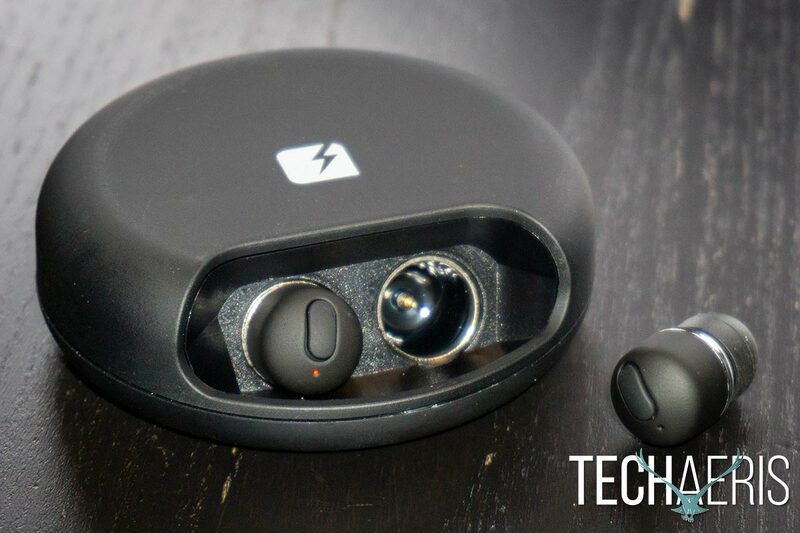 While wireless earbuds have been around for a few years now, wire-free earbuds (check our primer for the difference) are quickly gaining popularity. Unfortunately, a decent set of wire-free earbuds will cost you at least a couple hundred dollars. 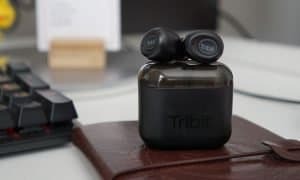 TRNDlabs is looking to change that and our NOVA True Wireless Earbuds review takes a look at their affordable true wireless earbuds to see how they stack up against more expensive offerings. The TRNDlabs NOVA True Wireless Earbuds are fairly compact and fit nicely in your ear once you have the proper size of earplugs installed. Each earbud is less than an inch long and cylindrical in shape. On the side where the earplug sits is a silver ring while the rest of the earbud is black. 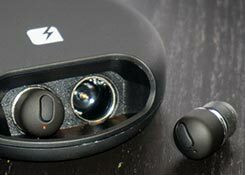 The NOVA True Wireless Earbuds and charging/storage case. On the outer end is a single oval-shaped button with a small hole above it. Inside this hole sits the LED light which is blue or red depending on the current state and function of the earbud. Each earbud has an R or L on the top side near the silver ring so you can easily tell which one goes in which ear. The black disc-shaped power case is about 3 ¼” in diameter and about 1″ in height. The TRNDlab logo is printed in white on the top with the website URL printed on the bottom. The power case is one piece with a cover that twists open. When holding the bottom of the case, twisting the top to the right allows you to access the earbuds. 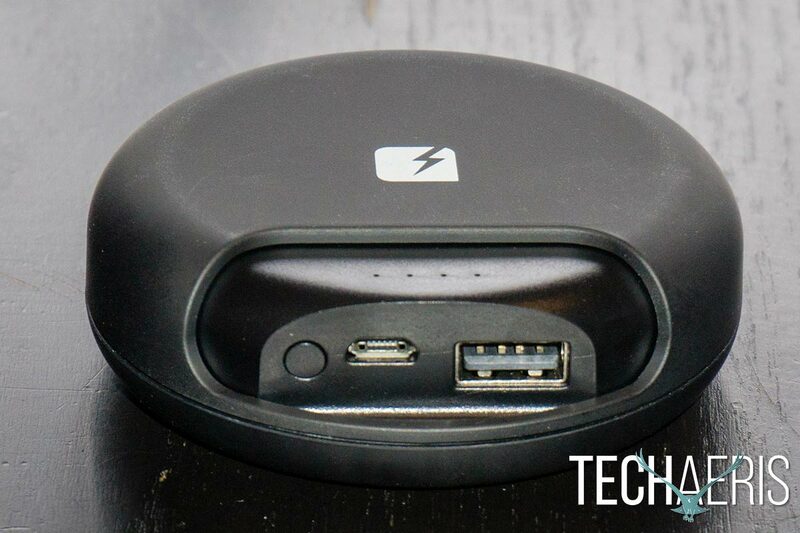 Twisting the top to the left, on the other hand, exposes the power indicator button, power indicator LED lights, Micro-USB charging port, and full-sized USB Type-A port for connecting to and charging your smartphone from the power case, which is a nice feature for those on the go. The ports on the back of the charging case. 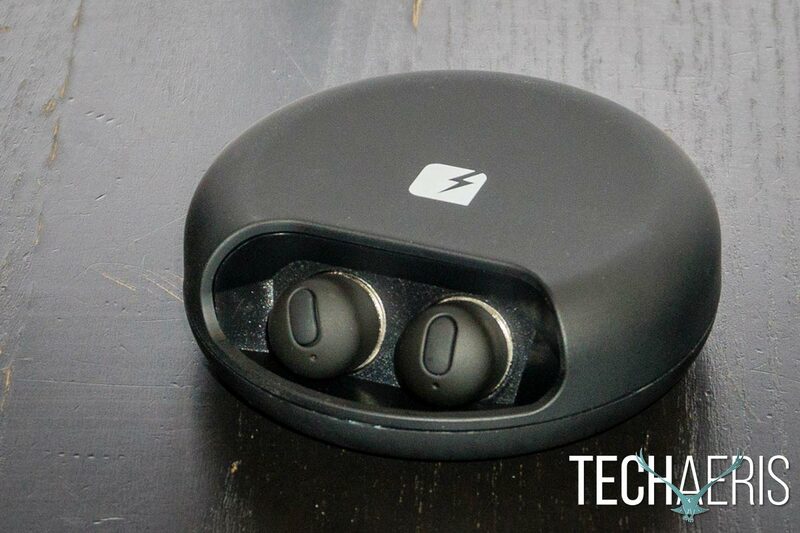 As mentioned above, each earbud has a single oval-shaped button on it. Start by pressing and holding the button on the left earbud until the light starts flashing, then repeat with the right earbud. According to the user guide, this should only take 3 seconds but in reality, it takes more like 10 seconds to power each earbud on. The first time you turn them on, they should show up in the Bluetooth settings on your smartphone at which time simply selecting them should pair them. Once they’re paired, you can turn them both on at the same time, but again, instead of the 3 seconds indicated in the manual, it takes about 10 to turn them on each time. While listening to music, a single press of the button will play or pause a track, as well as answer or end a phone call. A double press will redial the last call. Unfortunately, double or triple pressing while playing music doesn’t skip tracks as is the case for most single multi-function button controls on other wired or wireless headphones. As such, if you want to skip tracks you’ll need to pull out your phone to do so. Likewise, there’s no way to adjust volume from the earbuds either. As with all headphones, sound quality varies greatly even among similar styles. Traditionally, you could expect better sound quality the more you spent on a pair of earbuds. Lately, though, there have been some affordable exceptions that offer fantastic sound at an affordable price. Unfortunately, while the NOVA True Wireless Earbuds do get decently loud, there’s not much bass, even with the equalizer enabled. When the equalizer is enabled, the volume cuts down about 30%, causing the earbuds to be quieter but with richer sound. Even though they do get loud, they’re not overly loud, and listening at full volume is more than tolerable, unlike most other earbuds/headphones. On average, I found the volume to be acceptable when used at about 85%. One issue that wire free earbuds can suffer from is reception. In our case, the NOVA True Wireless Earbuds actually exceeded our expectations and we were about to get over 50′ from our music source before they started to cut out and skip. Unfortunately, that’s not the only reception consideration with wire free earbuds. In the case of the NOVAs, the right earbud consistently cut out at least once per listening session, if not more. When it did cut out, it was only for a second or two but it happened frequently enough that it is an annoyance and definitely interrupts your music listening pleasure. 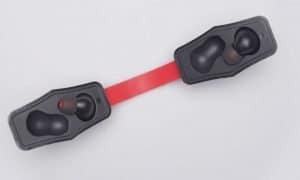 There were a few times we turned the earbuds on and after pairing the LEDs were flashing blue and red on both and nothing was coming out of the right earbud. In this case, you’re required to re-pair the earbuds to each other. With both earbuds off, press and hold the left earbud power button until it turns on, you hear pairing and a repeating beep. Do the same with the right earbud and after a few seconds they should be repaired. We didn’t have to do this often but it did happen enough to make mention here. According to TRNDlabs, the NOVA True Wireless Earbuds should last about 3 hours before needing to be recharged. 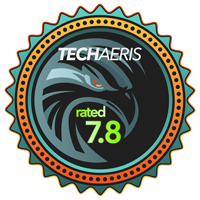 During our testing, we ended up closer to the 2 1/2 hour mark between recharges at about 85% volume. While the company also claims a one hour earbud recharge time, we were seeing 1 1/2 hours more often than not to fully recharge both earbuds. Simply place the earbuds in the case to recharge them. Additionally, we did see about 15 extra charges with the battery/storage case, which gave us about 37 1/2 hours of music playback without having to recharge the case. Even though we saw slightly larger charging times for the earbuds, it only took about 2 1/2 hours instead of the stated 3 hours to fully recharge the case on multiple occasions once it died. 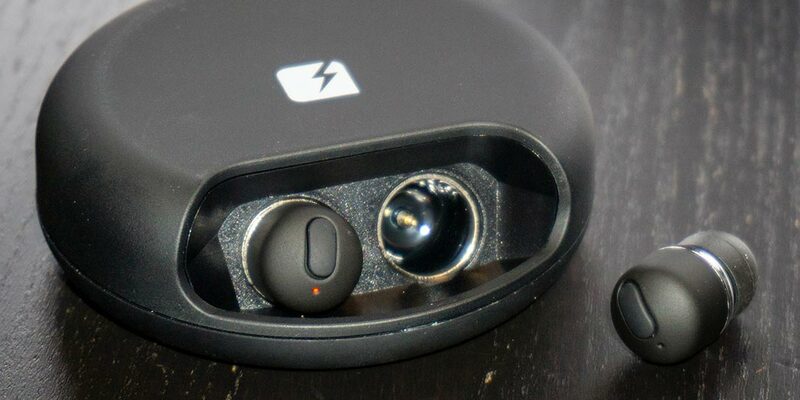 Of course battery life on the case will depend on if you use the USB port to charge your smartphones as well with it, but in any case, it should be good for at least a few earbud and/or phone recharges before needed to be recharged. The one big thing that the NOVA True Wireless Earbuds have going for them is the price. At $79.99USD, they are priced well below a lot of other true wireless earbuds on the market — especially name brand ones. 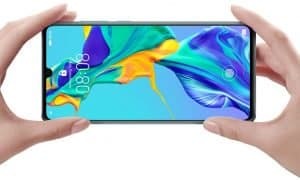 Unfortunately, the audio quality and occasional cutting out that we experienced are reflective of a lower price point and as such detract from the value. While affordably priced, the sound quality and other issues detract from the overall value. 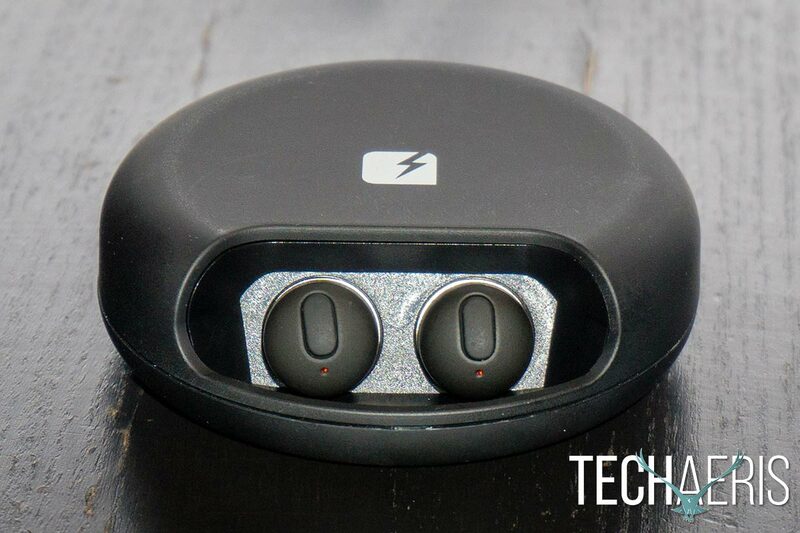 While we’ve reviewed plenty of affordable options with decent sound here at Techaeris, unfortunately, the NOVA True Wireless Earbuds fall a bit short. If you are after a pair of more affordable wire-free earbuds and aren’t overly picky about sound quality, the NOVA True Wireless Earbuds do have affordability and decent battery life going for them. *We were sent a sample of the NOVA True Wireless Earbuds for the purposes of this review.